Spinner’s get ready – It’s time for Tour de Fleece! 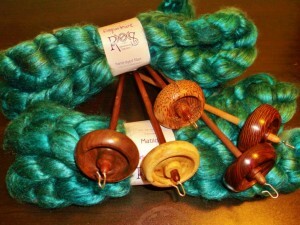 For those of you who are unfamiliar with this event, it was started by Ravelry as a fun way to spend a little time celebrating spinning while the Tour De France is “spinning”. This event is very informal and relaxed. The only rules are to try to spin every day of the Tour De France (July 2-24th with the exception of rest days July 11th and 19th) and to set your own challenge! Your challenge can be simple – i.e. spin for 15 minutes per day, or ambitious – i.e. try a new technique, or type of fiber or try for a speed record! Everyone’s goals will be different. There are multiple local teams (some are Team Rocket Spinners and Team Twisted Amphibians) as well as general groups – join as many as you’d like and have fun egging each other on! For more information see http://www.ravelry.com/groups/tour-de-fleece.